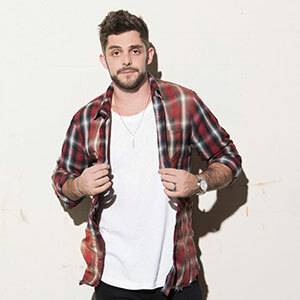 The country star Thomas Rhett was born Thomas Rhett Akins Jr. on March 30th, 1990. He was born in Valdosta, GA where he grew up with his mother and his father, singer Rhett Akins. Thomas toured with his father, who would let the little boy on stage to dance and perform silly songs like Getting Jiggy With It. While in high school Thomas took up a love for performing in front of crowds, and that's when he discovered he didn't want to do anything else with his life, just make music and make people happy. Eventually, he landed at Lipscomb University in Nashville, TN. But he didn't have much motivation in school, he practically went to school because he didn't want to be left alone in Georgia while all his friends went away to study. Instead of receiving a degree, he dropped out of school when he was twenty years old to pursue his musical dream. Soon after, he was signed to a record label and is now making his dreams come true. Though Thomas had girlfriends in college and after, he always had an eye for a girl from back home named Lauren Gregory, who he'd known since kindergarten. Eventually, the pairs paths crossed again and they started to date, and Thomas proposed to Lauren in 2011. The couple married a year later in October of 2012. They are still happily married to this day. That same year, Thomas debuted his first single "Something to Do With My Hands", and the album was realized a year later in 2013. The album worked its way to number one on the country music charts. Married life, a hit album, what more could a man ask for? Next, Thomas and Lauren wanted to start a family. Soon, they began trying to have their first child. When it wasn't working out the way that the planned, they eventually adopted their first daughter Willa Gray in May of 2017. After finding out the adoption was finalized, Lauren took a pregnancy test and realized she was actually, finally, pregnant. The couple welcomed baby Ada James in August of 2017. To say they have their hands full is an understatement. The surprise pregnancy after the adoption was the inspiration for the number one song "Life Changes", that is still getting played across radio stations nationally. Thomas and Lauren say they want to have more children, but whether they come from adoption or pregnancy is up to God's will. The only thing that Thomas can guarantee is that there will be more little mouths to feed, and more great music to be made. If having babies isn't enough to wear a man out, Thomas is going on tour from January 25, 2019 to October 12, 2019. He will be performing shows all around the world, including Australia, Mexico, Canada and the United States. One thing is for sure, seeing Thomas Rhett live will be one of the best shows you'll ever see in your life. He's been around stages and live music his entire life, he truly knows how to put on a show.